Bethesda Row is one of the area’s central features—a hub for living, working, shopping, and, of course, eating. 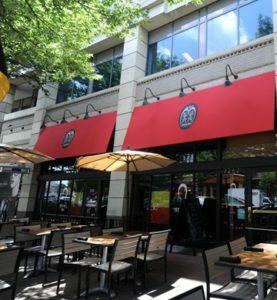 While Bethesda has exceptional dining options scattered throughout town, Bethesda Row restaurants offer options to dovetail with other activities, whether that means grabbing a bite after a shopping spree or having an elegant meal before seeing the latest Hollywood release. Even if you’re just looking for a snack, Bethesda Row has you covered, with options for gelato, frozen yogurt, and sandwiches, among other options. For this post, however, we’re focusing on the Bethesda Row restaurants that offer a complete experience. So give into temptation and enjoy an unparalleled start-to-finish dining experience at some of Bethesda’s finest restaurants. Jaleo is one of ten restaurants run by José Andrés’s ThinkFoodGroup. Andrés is a renowned chef—even breaking into Time magazine’s list of the world’s 100 most influential people—who gained worldwide accolades as head of the innovative El Bulli restaurant in Girona, Spain. The multi-location Jaleo highlights Spanish cuisine in small plates (tapas) as well as larger dishes, maintaining a casual, high-energy atmosphere. 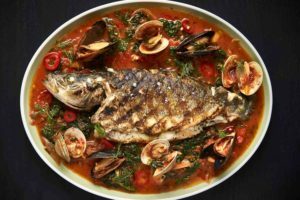 Kapnos Kouzina, from Washington DC–area chef and restauranteur Mike Isabella, features rustic but elevated Greek cuisine in an open kitchen restaurant. A focus on small plates makes for unique communal dining, whether that means passing small, individual bites or sharing large plates intended to feed the entire table. Hours: Monday to Friday, 11:30 a.m. to 10:00 p.m.; Saturday, 11:00 a.m. to 11:00 p.m.; Sunday, 11:00 a.m. to 9:00 p.m.
Mon Ami Gabi offers the classic delights of a French bistro, including an extensive list of more than 80 French wines, from Bordeaux to Rhone reds and the requisite champagne list for special occasions. The focused menu includes a submenu of steak frites, allowing guests to choose a cut and sauce for an indulgent dinner. Hours: Monday to Thursday, 11:30 a.m. to 10:00 p.m.; Friday and Saturday, 11:30 a.m. to 11:00 p.m.; Sunday 10:00 a.m. to 10:00 p.m.
With late-night hours on weekends, the Mussel Bar & Grille offers thoughtful cuisine without pretention—blackboard menus, a generous beer selection, and live rock music define the atmosphere. Chef Robert Wiedmaier’s goal of creating the type of establishment haunted by fellow chefs in the late hours helps explain the dedication to food and fun. Hours: Monday to Thursday, 11:30 a.m. to 11:30 p.m.; Friday, 11:30 a.m. to 1:00 a.m.; Saturday, 11:00 a.m. to 1:00 a.m.; Sunday 11:00 a.m. to 11:30 p.m. Sometimes, it’s simply impossible to beat thoughtful, seasonal bar food served in a relaxed yet sophisticated setting. This is the aspiration of Redwood Restaurant and Bar, which delivers on that promise with a menu that rivals some of Bethesda Row’s most food-forward restaurants. Redwood focuses its drink menu on hard-to-find wines, which pair well with its ample selection of locally produced cheeses and cured meats—all while offering a simple burger (beef or veggie), too. Hours: Monday to Wednesday, 11:30 a.m. to 2:30 p.m. and 5:30 p.m. to 9:00 p.m.; Thursday, 11:30 a.m. to 2:30 p.m. and 5:30 p.m. to 10:00 p.m.; Friday, 11:30 a.m. to 2:30 p.m. and 5:30 p.m. to 11:00 p.m.; Saturday, 11:30 a.m. to 3:00 p.m. and 5:00 p.m. to 11:00 p.m.; Sunday, 10:30 a.m. to 3:00 p.m. and 5:00 p.m. to 9:00 p.m.